Warm the stock in a medium size saucepot and pre-heat the oven to 400ºF. In a small bowl, soak the bread in the milk. Place the meat in a mixing bowl and add the egg. Wring out excess the milk from the bread and crumble into the meat bowl. Season the meat with salt, pepper, oregano or marjoram, mint, half the parsley, the onion, garlic, lemon zest and spinach. Drizzle EVOO once around the bowl and mix the meat with your hands. Roll 20 meatballs and arrange them on a nonstick or parchment-lined baking sheet. Bake for 15-18 minutes, until cooked through and browned. Meanwhile, melt the butter in a saucepot over medium to medium-high heat and add the pasta. Brown until nutty and fragrant and deep golden in color. Stir in a few ladles of warm stock and allow it to almost cook away before adding more, like preparing risotto. Keep adding stock a little at a time until it’s all incorporated and pasta is al dente. Stir in the lemon juice and feta cheese. Serve the orzo in shallow bowls topped with meatballs. In Recipes-list.com we have selected the most viewed recipes from category - uncategorized . Enjoy the best recipes specially selected for you! 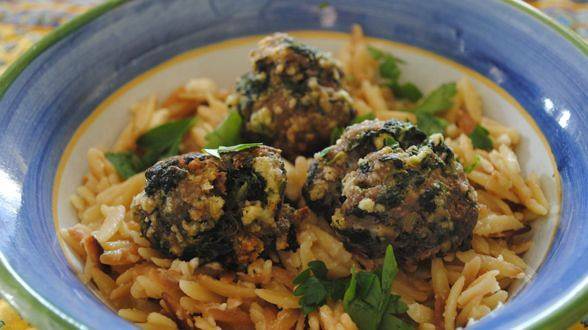 Greek Meatballs and Toasted Orzo is the right choice that will satisfy all your claims.